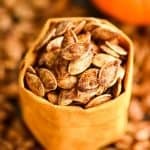 Homemade Cinnamon Sugar Pumpkin Seeds Recipe! Don't throw away the seeds when you carve pumpkins this year! Save them and make this recipe for the perfect sweet and salty fall snack! Vegan, gluten-free and dairy-free! and paleo-friendly! Remove from pumpkins and rinse thoroughly. Spread out in a single layer on a baking sheet lined with paper towels. Let sit at room temperature for 24 hours, changing the damp paper towels out for dry ones after about 12 hours and stirring occasionally. Preheat oven to 325°F. Very lightly grease a large baking pan, set aside. In a small bowl, mix together sugar, cinnamon, and salt. Set aside. Melt coconut oil or butter in a large microwave safe bowl or on the stovetop in a 4-quart pot. Mix in pumpkin seeds until they are all evenly coated. Add dry ingredients to the pumpkin seeds and mix until all they are evenly coated. Spread pumpkin seeds on your prepared baking pan in single layer. Bake for 25-35 minutes, stirring every 10 minutes, until seeds begin to brown. To test for doneness: remove a few seeds from the pan and let sit on the counter to cool. If they harden up the seeds are done. If they remain soft, return to the oven, checking them after 5 minutes. Continue baking in 5 minute intervals until done. Once seeds are done, transfer them from the warm pan to another pan lined with parchment paper to let cool. *You may use coconut sugar for a refined-sugar free option. Carving three large pumpkins resulted in 3 cups of seeds. You can easily halve this recipe to accommodate the amount of seeds you harvest from your pumpkins!